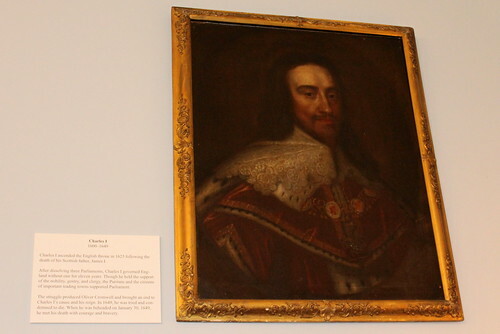 Charles I (1600-1649) ascended the English throne in 1625 after the death of his Scottish father, James I. After dissolving three Parliaments, Charles I governed England without one for eleven years. Though he held the support of of the nobility, henry, clergy, the Puritans and the citizens of important trading towns supported Parliament. The struggle produced Oliver Cromwell and brought an end to Charles I's cause and his reign. In 1649, he was tried and condemned to die. When he was beheaded on January 30, 1649, he met his death with courage and bravery.